Find the best yoga mat and a little inner peace with help from this Walmart Canada Buying Guide. It features yoga mats for beginners and long-time yogis alike. Now that you’ve vowed to make more time for yourself each day by practising calming yoga poses, make sure you have a good yoga mat you can use at home or take to class. Whether you’re working on your Warrior II Pose or cooling down in Child’s Pose, you’ll need a safe and comfortable surface underneath you. Walmart.ca has mats in a range of materials, thicknesses and prices to suit your needs, so you never have to miss a chance to practise your poses and enjoy a few minutes of serenity—even on the most hectic days. When you hear yoga practitioners rave about the stickiness of a mat, it’s a good thing. This one by PurAthletics has a highly textured surface to provide a reassuring grip for your hands or feet. This mat will help you feel stable during standing poses such as Tree or Half Moon. Comes with a handy carry strap for easier portability. Here’s an oversized Everlast yoga mat that’s 72 inches in length, which is longer than the standard 68-inch mat. For the taller yoga enthusiast, you might appreciate this longer mat so you can fully stretch out into a Downward Dog. This non-slip, latex-free mat helps provide traction and protection on hard floors. This mat features graphic designs of basic yoga poses printed right on it. Here’s a great option if you practise hot yoga. Intended to be rolled out on top of a yoga mat, this one by Merrithew has an absorbent microfibre side that helps give you an anti-slip surface as you perspire during sequences and stretches. It’s ideal for the humid environment of Bikram yoga classes because it’s also infused with bamboo and charcoal to help keep bacteria and fungus at bay. Comes with a downloadable bonus exercise guide. If you’re environmentally conscious or have allergies, you might prefer this Jelinek Cork yoga mat. Made of a sustainably sourced material, its natural antimicrobial qualities and hypoallergenic surface can help prevent bacteria, mold and odours. The cork’s natural texture feels soft and warm underfoot while helping to provide grip, stability and durability as you move through each sequence. Perfect for relaxing lunchtime yoga classes at the office or at your favourite studio, this 3 mm Lotus yoga mat is easy to roll up, so you can carry it or tuck it neatly out of the way. It also features a trendy pattern printed on one side to help breathe new life into your regular yoga practice. Here’s a thicker option that might be more comfortable on your pressure points, so you can relax, focus on the moment and just be. The 5 mm thick Empower yoga mat can help provide the extra cushioning and stability you require whether you’re flowing through a Sun Salutation or holding a challenging side plank. When you want even more comfort and traction, the 6-mm PurEarth Ekko mat offers a bit more thickness, a grippy texture on both sides and is extra long at 72 inches. Among Walmart’s thickest mats, it’s a great choice whether you have joint issues or enjoy doing yoga on the beach or in the park. 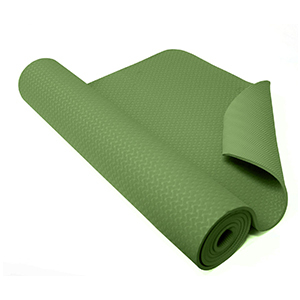 This oversize yoga mat by Zenzation Athletics also features an antibacterial close-cell design aimed at helping to resist moisture for sanitary reasons. This reversible PVC yoga mat by Iron Body Fitness—IBF is lightweight with a thickness of 6 mm for added cushioning. The mat is designed with a non-slip surface to help you maintain your stability as you move through your Ashtanga series. It can also help to provide comfort as you relax in a restorative Savasana. A carry strap is included. Super affordable, this Athletic Works yoga mat is great whether you’re going to your first gentle Hatha class or simply want to have a spare yoga mat. I keep one of these mats rolled up next to the TV to encourage me to sit on the floor and do some stretching and deep breathing exercises while watching my favourite shows. I’m convinced doing so prevents me from having restless legs when I go to bed at night and helps me sleep better! Just breathe. With these yoga mat Buying Guide ideas at your fingertips, it’s easier to find the ideal style for you at Walmart.ca. We’ve done the guesswork for you so you can have more time to enjoy the many benefits of yoga.